What appeals most to me in a recipe is the potential – the versatility of substituting one or two ingredients and giving the dish an entirely new flavor. That’s the beauty of this recipe. It has only two essential ingredients: puff pastry and a filling. It’s fast and easy: Grab frozen puff pastry and a jar of pre-made (or homemade!) pesto, sundried tomato jam, or bacon jam. 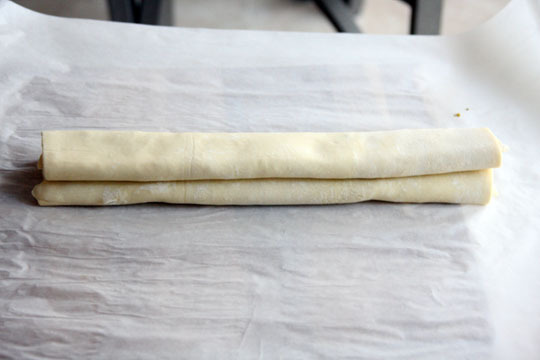 Or it can be complicated: Make your own puff pastry. Sweet or savory, you decide what you want on the inside. Today, I wanted pesto. A quick and elegant appetizer. 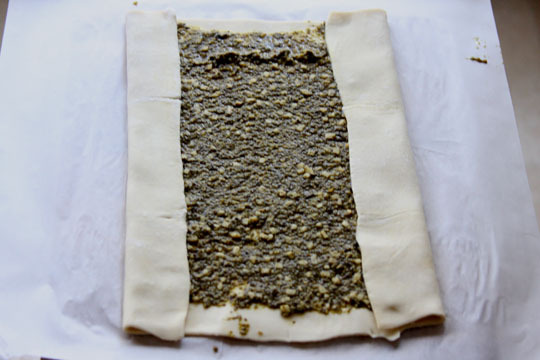 Roll out the puff pastry on a piece of parchment into a 12x12 inch square. 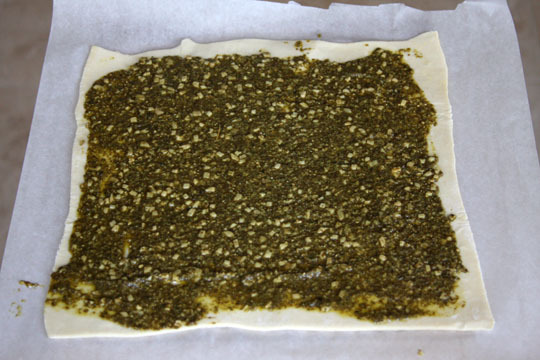 Spread the pesto within 1/2 inch of each side of the pastry (you might use more or less than 1/2 cup). Using your spatula, make three indentions on the top edge of the dough at 3 inches, 6 inches, 9 inches to divide the sheet into quarters. I've stopped here and frozen the palmiers for later use. Just let the logs thaw a bit and then proceed. Cut into 1/2 inch slices and place onto parchment-lined baking sheets. Whisk egg and water together and brush over the palmiers. Bake for 8 minutes, flip, and bake for an additional 6-8 minutes. Palmiers are best the day of baking. *I used a traditional basil pesto recipe for this batch. Cilantro-pecan pesto, olive tapenade, sun-dried tomato pesto, and marinara also work wonderfully in this recipe. 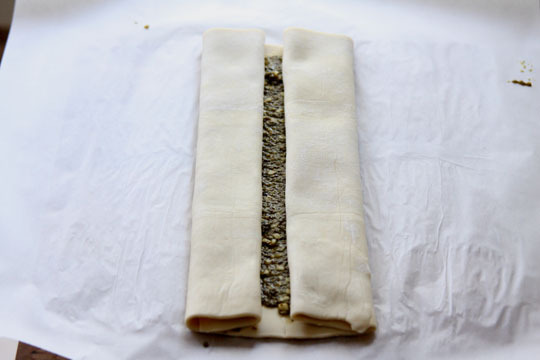 Gotta try these – love puff pastry and love pesto! These looks so much prettier than when I make them! I think I cut them into pieces too thick–I like the thin, crisper look that yours have. I’m a big fan of the pesto combined with some cheddar cheese. What a great idea. 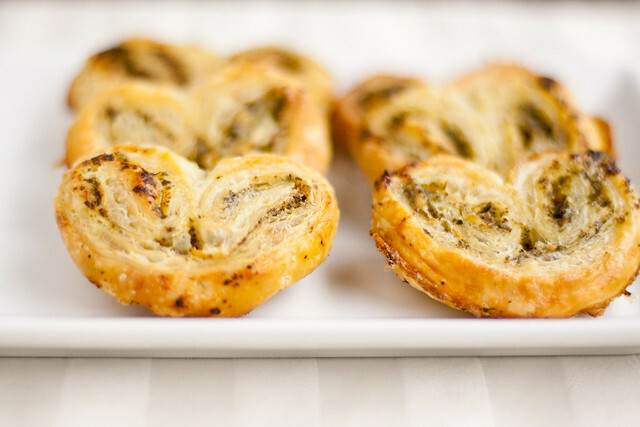 I’ve never thought of making savory palmiers, but it makes so much sense. Beautiful! I love how you can get something so amazing but it didn’t take you all day. These look really yummy. I’m adding it to my list of recipes to try. Thanks! These look wonderful! And I love the little heart shape they make. How cute! Wow, such a versatile appetizer recipe. I love the simplicity of it and the fact that it can be frozen in advance. I’m definitely going to have to try this. Thanks! yum! not sure if i’m ready to tackle home made puff pastry yet but i could totally see myself making this w/the store bought stuff 🙂 so easy and looks so good! Hmmm…I just happen to have Pepperidge Farm Puff Pastry in my freezer and Pesto in the fridge… Its a definite must try. Lovely palmiers! Me again! 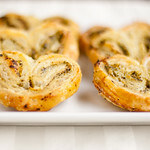 I made the Pesto Palmiers for our Superbowl party and they were a total hit. Thank you so much for the great recipe! You can check out the palmiers I made here. Made these for a Christmas Eve party and they went down pretty well. Although multiple people told me “Laura, I liked your pinwheels.” So I’mma just call them that. Posted some pictures of the ones I made on my blog.